Irenaeus defended the doctrines taught by Christ. IN MANY WAYS, the clear-minded, active and bold Irenaeus was ideally situated to meet the needs of the church in his day. The second century was an age of church expansion, persecution by authorities, and heretical controversy. The canon of the New Testament was not yet formed, and heresies such as Gnosticism and Marcionism were misleading the gullible. Church structure and hierarchy were still in flux. As a young man Irenaeus had studied with Polycarp, a disciple of the apostle John, and learned from him the Gospel as it had been taught by Christ. The soundness of this Gospel and the example of Polycarp’s martyrdom had a profound effect on Irenaeus. He became a missionary to Gaul (modern-day France), settling in Lyons. Irenaeus was on a mission from Gaul to Rome, carrying a message to warn the pope against the Montanists, when persecution broke out in Lyons. On his return, he became leader of the Lyons church, Bishop Pothinus having been among the victims. He showed his vigor by converting much of the populace of Lyons, and spreading Christianity throughout Gaul. We owe to Irenaeus an early list of the canon of the New Testament—the Gospels, letters, and other early Christian writings which were acknowledged to be of apostolic origin. He also developed an early form of the teaching of apostolic succession, which he used to combat the Gnostics: he argued that the real church could show direct lines of consecration back to Christ, which heretics could not. In his own case, the linkage was short indeed: Christ —> John —> Polycarp —> Iraeneus. 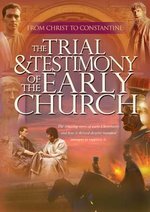 Trial and Testimony of the Early Church covers the era and themes that were also important to Irenaeus. Irenaeus also reasoned with the bishops of Rome. When Bishop Victor tried to excommunicate eastern churches that did not observe Easter on the same day as Rome, Irenaeus reminded him that an earlier bishop of Rome had embraced Polycarp despite such differences. Eventually, Victor dropped his attempt to impose the Roman view on the whole church. Many sources describe Irenaeus as a martyr, but we have no details. Catholics and Anglicans remember him with a feast on this day, 28 June.